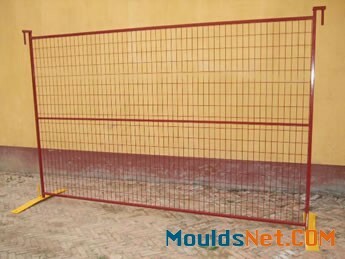 The welded portable fence is made of high quality steel wire strands and welded together to form a high strength mesh. 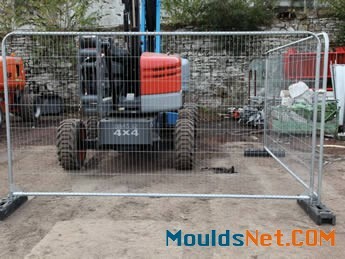 The welded mesh is fully welded to the frame and form a strong portable fence panel. Welded portable fence is corrosive and rust resistant, strong, durable, safe, easy to install and remove. With so many features of the welded portable fence, it is widely used in the construction site, residences, public events and other applications. The welded portable fence is not a single fence panel, it is a whole system, which contains the fence panel, clamps, feet, stays and other accessories. 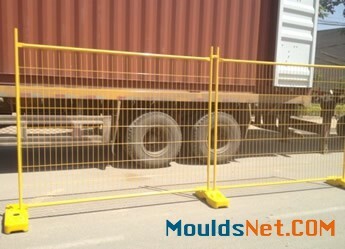 Welded portable fence panel is the main part of the portable fence system. It is made of infilled high quality carbon steel welded mesh and the steel frame outside. 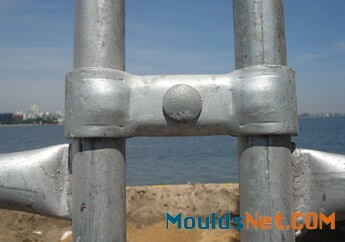 All the welded mesh are 360 degrees welded to the frame to form a strong structure. Surface treatment. The welded portable fence panel can be divided into hot dipped galvanized portable fence, PVC painted and powder coated portable fence. The surface treatment supplies a corrosive and rust resistant surface to the system, which can ensure the long service life. Powder coated welded portable fence. Typical types. 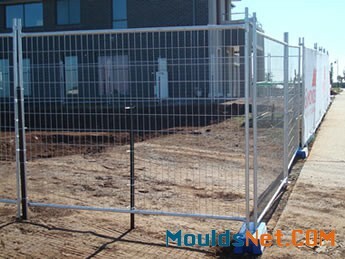 The typical welded portable fence is Australia portable fence and Canada portable fence. 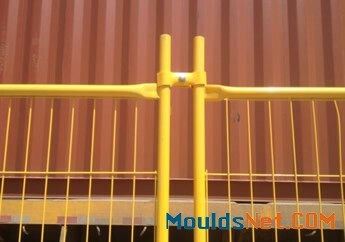 There are various other specifications of the welded portable fence. Different top style. There are two type of welded portable fence panel according to the top. They are standard square top welded portable fence panel and round top welded portable fence panel. Wire diameter: 3mm - 6mm. Mesh size: 60mm × 150mm, 50mm × 100mm, 60mm × 120mm, 75mm × 150mm, etc. Panel size: 1.8m × 2.3m, 1.8m × 2.4m, 1.8m × 2.9m, 2m × 3.5m, 2.1m × 2.9m, 2.1m × 2.4m, 2.1m × 3m, 2.1m × 3.3m, 2.25m × 2.4m, etc. frame: O.D. 25mm, 32mm, 35mm, 38mm, 40mm, 42mm, 48mm. frame thickness: 1mm - 3mm. base feet: plastic, rubber, concrete or metal. Zinc thickness: 42 microns or 28 microns. Main market: Australia, Canada, America, European countries and Asia countries. The anti-climb portable fence are manufactured from the highest quality fencing materials for superior performance, durability and value-for-money. Anti-climb portable fence infilled mesh uses closer wire spacing to prevent unwanted site intrusion with no opportunity for hand/footholds on panels, making anti-climb temporary fences practically impossible to scale. Top type: square type and round top. Square top is the standard top style. It can be divided into standard anti-climb square top and heavy duty anti-climb square top. Because of the strengthening panel corners and adding only a little extra weight, round top anti-climb portable fence is one of the most secure options for maintaining the integrity of temporary sites. Square top anti-climb portable fence. Round top anti-climb portable fence. Level type: standard anti-climb portable fence and heavy duty anti-climb portable fence. The standard anti-climb portable fence uses the 38mm steel pipe in upright and 25mm steel pipe in top and bottom rails. The heavy duty anti-climb portable fence uses 38mm frame throughout. Infilled mesh opening: 38mm × 253mm, 85mm × 261mm, 42.5mm × 261mm. Horizontal frames diameter: 25mm, 38mm. High quality portable fence clamps are used to fasten the panels together. They can hold the pipe in place, even under extreme pressures. It is specially moulded to a 4mm thickness for additional strength. The portable fence clamp can be hot-dipped galvanized or powder coated. The welded portable fence support bases are designed to fix the fence panel to the ground. They are also the characteristic of the portable fence. They need not drill holes on the ground. They can supply the strong and durable stabilization without damaging the ground. The base feet can be packed together to save space in the transportation. 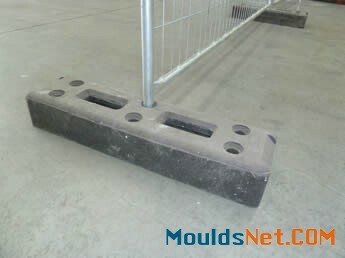 The welded portable support base can be metal, plastic, rubber and concrete. The plastic base can be one part base and two part base. 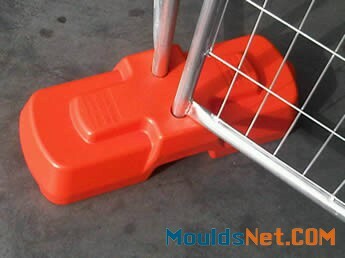 Plastic welded portable fence support base. Rubber welded portable fence support base. The welded portable fence stays & bracings are used for supporting the temporary fence in the high wind areas. They can supply extra durability to the fence panel and ensure the fence panel can be working in the harsh environments. Each stay should be supported with three base feet and at least two clamps. Welded portable fence shade cloth can be installed on the fence panels to reduce the visibility of the sites to keep the privacy of the sites. Besides, the shade cloth can resist to the UV shines and it can prevent the dust and debris from blowing off the sites. Welded portable fence stay can offer extra stabilization of the fence in high wind areas. 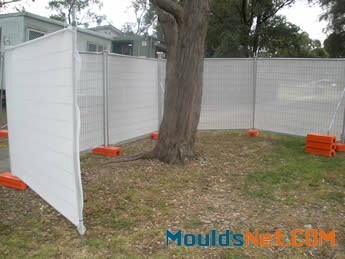 The shade cloth of the welded portable fence can prevent the falling leaves from blowing off the site. Safety. It can protect the security of both the public and the workers. Corrosion and rust resistance. The hot dipped galvanized, powder coated and PVC coating all have excellent corrosion and rust resistance. Privacy. Shade cloth can be supplied to reduce the visibility and minimize the public’ s exposure to dust and debris. Various color available. The powder coated and PVC painted surface treatments supply various colors for choice and make the fence panel more attractive. Easy installation and removal. 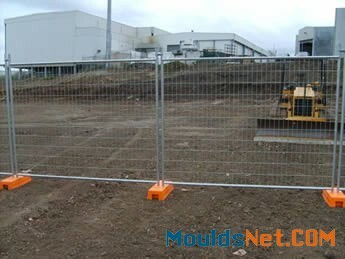 The temporary fence need not dig holes on the ground, it can be installed and remove easily and without any tools. Strong and durability. The infilled mesh and the framed is 360° weld between the vertical and horizontal pipe, so it can ensure the portable fence a strong and durable structure, which can last a long service life. Easy to transport. The fence panel is separated from the feet, it can reduce the space of the transportation and it is convenient to transport. High strength. Horizontal pipe ends crimped for increased strength. Welded portable fence acts as a barrier between crowds and whatever they need to be kept away from for the reasons of safety, privacy or to stop interference in an activity. 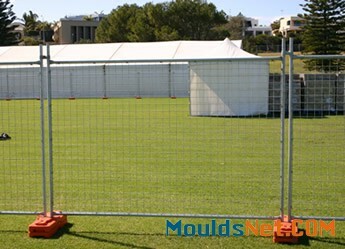 Welded portable fence is most commonly used at events such as concerts and festival to keep crowds away from stage areas. It can be used in the sports ground, exhibitions and dangerous areas to secure the safety of people. 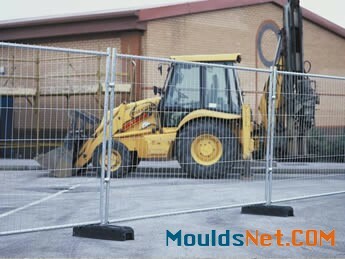 Welded portable fence can be used in construction sites to protect the safety of both the sites and the workers. It can be used in the residences to guard the sites and maintain the privacy of the residences. Welded portable fence can be used in the road, walkways and other high traffic areas to separate the peoples from the vehicles and protect the safety of the pedestrian. 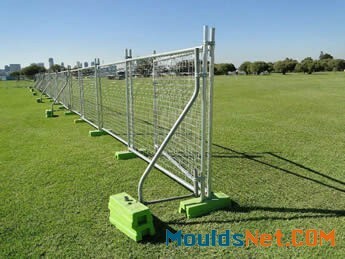 Welded portable fence can be used in the sports ground to protect the safe of people. 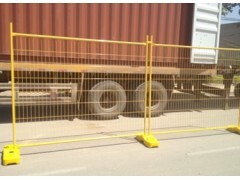 Welded portable fence can be used in the construction site to protect the safe of site and workers. Hebei Keshi metal Wire Mesh Co.,Ltd.